So I know I try out a lot of products, review my favorite ones and it might overwhelm a new natural looking for advice and what products to buy to start her journey. YOU REALLY JUST NEED 5 TYPES OF PRODUCTS!!! Just 5, really and you're fine.....(unless you have problem hair, then please meet up with someone knowledgeable about hair). What type you use is all up to you, the products available in your location, your hairtype and your pocket. So let me explain what each one does and what to look out for. These are what you use to wash out all the nasties (dirt, dust, sweat, twigs, leaves etc) out of your hair and the gentler it is i.e. the less it dries out your hair the better. I listed them from the most stripping to the least. These ingredients were good for the days when most of our styling products contained petrolatum, parafinnum liquidum but if you want to start up, just avoid them. There are two basic types of cleansers you need depending on your follow up i.e. styling products and leave ins. clarifying shampoo - contains an active chelating agent that binds to metals and removes them from the hair, as well as an equalizing agent. balancing shampoo - washes away excess oiliness, while preventing the hair from drying out. color-enhancing shampoo - used to brighten, to add a slight color, and to eliminate unwanted color tones. As a newbie, start with a moisturising sulfate free shampoo, then as your regimen develops and you understand your hair better, you can switch to other types. These are applied to the hair to deposit moisturisers and/or proteins to help restore the hair's strength, give hair body, and protect hair against possible breakage. *Rinse out conditioners - these are useful for detangling and depending on the ingredients, you can possibly leave a little of it in. - Treatment or repair conditioner which help restore protein and moisture and sometimes require longer processing time or the application of heat. - Protein conditioner designed to penetrate the cortex and reinforce the hair shaft from within to temporarily reconstruct the hair. As a newbie, you just need a rinse out conditioner. You can then purchase others depending on the needs of your hair. 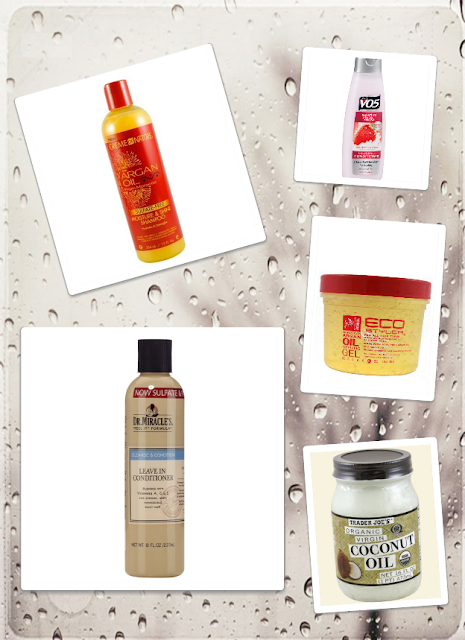 Leave-in conditioners as the name implies are applied to the hair and not rinsed out. They contain humectants e.g. glycerine which are substances that absorb moisture or promote the retention of moisture. Popular question is what is the difference between a leave in conditioner and a moisturiser? It all depends on formulations. Basically for the sake of simplifying, moisturisers are usually heavier and more oily than leave in conditioners. Truth is that it is used interchangeably with leave in conditioners to describe conditioners you don't need to rinse out and mositurisers...well for moisturising your hair. I prefer lighter formulas for daily use as they generally contain more water and don't easily build up for those that can be heavy handed. But during the dry season it's best to switch to heavier formulas (moisturisers). Both types simply keep your hair hydrated on a daily basis. Leave In Conditioners are to be used daily so for this purpose try to avoid the ones with petrolatum, mineral oils, silicones ending in -cones and -xanes especially if it's among the first 5 ingredients. You will need to wash them out with a shampoo containing sulfates which over time dries out your hair. - stylers for shine etc. The more uses you can get out of your styler, the better for you. A basic styler for a newbie is a moisturising alcohol free gel i.e. No alcohol denat., ethanol. You can then purchase other stylers depending on your styling needs. Oil is important for natural hair because they help minimise water loss, help strenghten strands and keep them supple/ elastic. They are also a good vehicle for introducing agents that benefit the scalp and follicles. There are two basic types of oils. Essential oils are like concentrated plant phytochemicals gotten from leaves, flowers etc and thus care must be taken when using them. They are usually diluted in carrier oils i.e. regular oils. e.g. rosemary essential oils, orange peel essential oil etc. Regular oils which are usually gotten from the seeds, fruits or leaves of oily plants. the common method of getting these oils is by pressing them or by heating them up. e.g. castor oil, coconut oil, palm kernel oil, shea butter oil etc. As a newbie, the basic oils to start with are shea butter, coconut, palm kernel, olive, castor oils etc. You really shouldn't get an essential oil until you have done your research about the purpose and method of use including the risks involved. Coming out of a long period of relaxer damage or just plain neglect most newbies need deep conditioning as much as the oldies. And Butters are a curly girl's delight.